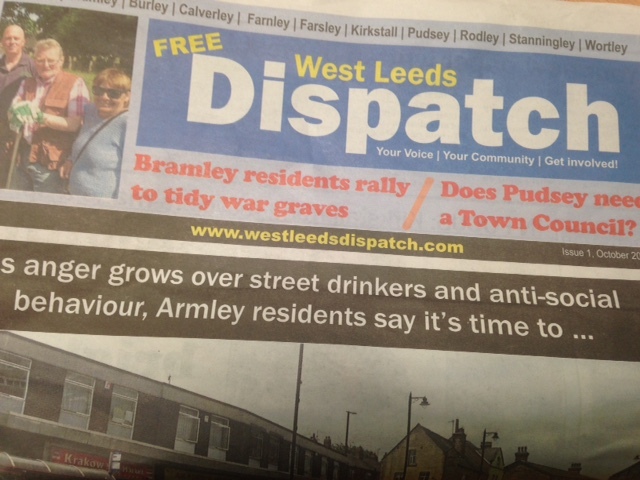 Join the West Leeds Dispatch survey | West Leeds Dispatch | News. Views. Get involved! Your West Leeds Dispatch has been up and running for six months now – and we thought now was as good a time as any to ask YOU what YOU think of us. It’s been busy period. Our site is updated daily during the week and we’ve featured hundreds of posts on a variety of local issues, featured dozens of community groups who may not normally receive publicity and – crucially – record more than 95,000 page views since we first started at the end of May. We’ve also produced the first pilot issue of our print edition. Follow the link below to go to our quick two-minute survey where you’ll be asked to answer (anonymously) ten questions about The Dispatch. Your answers will help shape our future content and direction. Take part in our survey here. We’d love to hear your thoughts! Closing date is the end of November. Thanks in advance. You can always email us at news [at] westleedsdispatch.com with your views and ideas.